Hive is trying to embrace CBO(cost based optimizer) in latest versions, and Join is one major part of it. Understanding join best practices and use cases is one key factor of Hive performance tunning. This article will explain each kind of join and also use explain plan output to show the difference. Note: All below tests are based on Hive 0.13. The shuffle join is the default option and it includes a map stage and a reduce stage. Mapper: reads the tables and output the join key-value pairs into an intermediate file. Shuffle: these pairs are sorts and merged. Reducer: gets the sorted data and does the join. It works for any table size. Especially when other join types cannot be used, for example, full outer join. Most resource intensive since shuffle is an expensive operation. The largest table should be put on the rightmost since it should be the stream table. However you can use hint "STREAMTABLE" to change the stream table in each map-reduce stage. 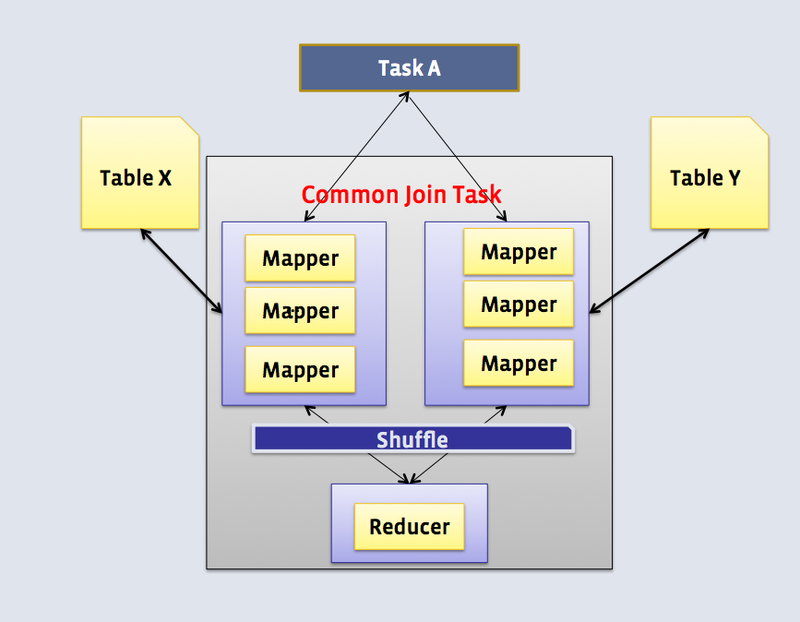 If one or more tables are small enough to fit in memory, the mapper scans the large table and do the joins. No shuffle and reduce stage. Small table(dimension table) joins big table(fact table). It is very fast since it saves shuffle and reduce stage. It requires at least one table is small enough. Right/Full outer join don't work. Here passwords3 table is very small table while passwords table is huge. 1. Auto convert shuffle/common join to map join. Starting from Hive 0.11, hive.auto.convert.join=true by default. You can disable this feature by setting hive.auto.convert.join=false. When hive.auto.convert.join.noconditionaltask=true, if estimated size of small table(s) is smaller than hive.auto.convert.join.noconditionaltask.size(default 10MB), then common join can convert to map join automatically. From above SQL plan output, we know estimated "Table b's Data Size=31" according to statistics. 2. Hint "MAPJOIN" can be used to force to use map join. Before using the hint, firstly make sure below parameter is set to false(Default is true in Hive 0.13). Join is done in Mapper only. 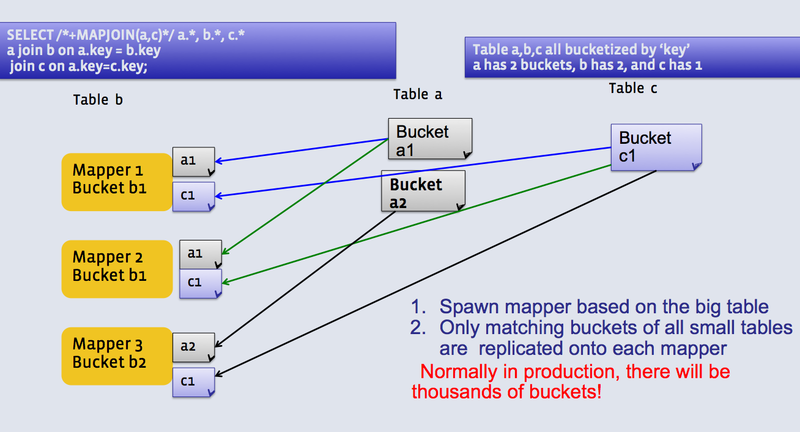 The mapper processing bucket 1 for table A will only fetch bucket 1 of table B.
Bucketed using the join columns. The number of buckets in one table is a multiple of the number of buckets in the other table. Tables need to be bucketed in the same way how the SQL joins, so it cannot be used for other types of SQLs. 1. The tables need to be created bucketed on the same join columns and also data need to be bucketed when inserting. One way is to set "hive.enforce.bucketing=true" before inserting data. 2. hive.optimize.bucketmapjoin must to be set to true. Join is done in Mapper only. The corresponding buckets are joined with each other at the mapper. Sorted using the join columns. All tables have the same number of buckets. Partition tables might slow down. 1. The tables need to be created bucketed and sorted on the same join columns and also data need to be bucketed when inserting. 2. Below parameters need to set to convert SMB join to SMB map join. 3. Big table selection policy parameter "hive.auto.convert.sortmerge.join.bigtable.selection.policy" determines which table is for only streaming. 4. Hint "MAPJOIN" can determine which table is small and should be loaded into memory. 5. 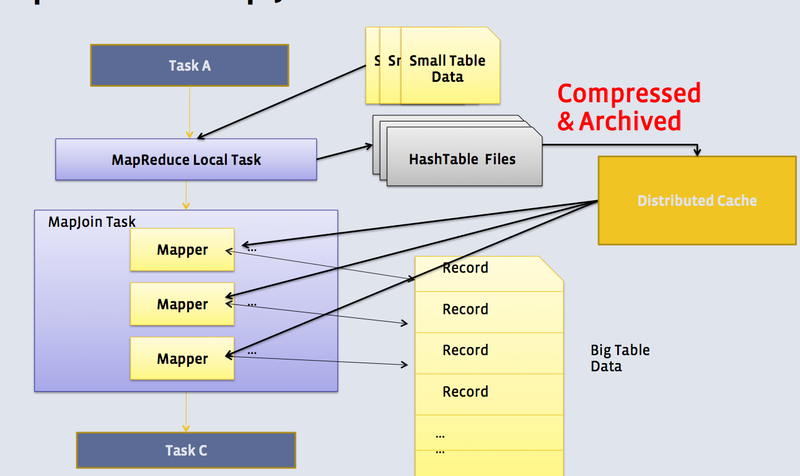 Small tables are read on demand which means not holding small tables in memory. 6. Outer join is supported. If table A join B, and A has skew data "1" in joining column. If it has key 1, then use the hashed version of B to compute the result. For all other keys, send it to a reducer which does the join. This reducer will get rows of B also from a mapper. This way, we end up reading only B twice. The skewed keys in A are only read and processed by the Mapper, and not sent to the reducer. The rest of the keys in A go through only a single Map/Reduce. The assumption is that B has few rows with keys which are skewed in A. So these rows can be loaded into the memory. One table has huge skew values on the joining column. One table is read twice. Users should be aware of the skew key. As above shows, there are 2 join operators, one is common join and the other one is map join. And it shows "handleSkewJoin: true". 1. Below parameter needs to be set to enable skew join. 2. Below parameter determine if we get a skew key in join. If we see more than the specified number of rows with the same key in join operator, we think the key as a skew join key. Thank you for the post! It was very useful for me. Its was very userful...Thank you for the post.. Thanks for the awesome post..
1 of them is a large table and other one is a small table. When i enforce the parameters mentioned in your blog as mentioned, My run time is going higher than actual existing query. Can you please let me know how i can optimize my query and reduce the run time..
a. How many "Stages" are spawn for #1 and #2? b. Which "Stage" is causing the performance difference? c. For that problematic "Stage" in #2, I think it should be a map-reduce job, then you should check how many mappers and reducers are spawn for this map-reduce job. How about #1?